Epiphyllum phyllanthus var. hookeri (Link & Otto) Kimn. Shrubs, to 200 cm, epiphytic. Stem segments light green, 40-120 × 6-9(-10) cm, margins obtusely serrate; areoles 3-8 cm apart along margins. Spines occasionally present in basal areoles, to 3 per areole, hairlike. 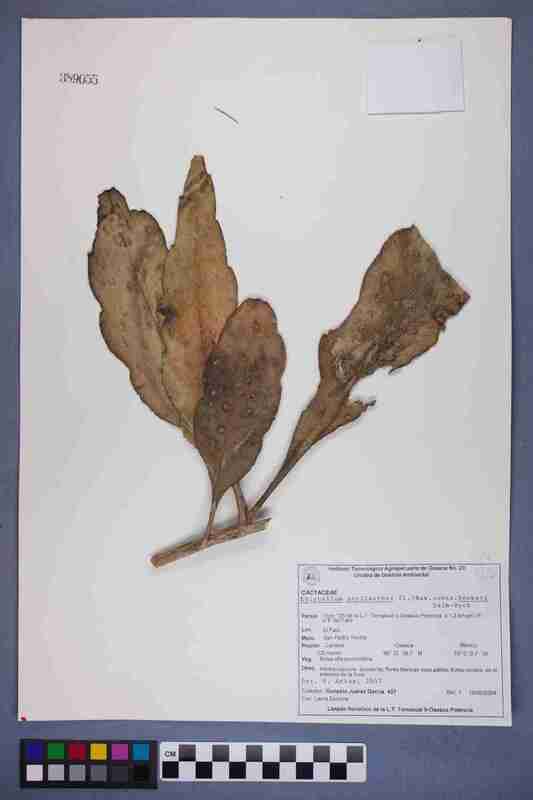 Flowers salverform, 19-23 × 10-15(-16) cm; flower tube slender; outer tepals greenish white; inner tepals 8 × 0.5 cm. Fruits purplish red, typically 5-angled from the flower tube podaria, smooth between the ridges, oblong, 40-70 × 20-35 mm. Seeds 3.2-3.5 mm, minutely pitted. Flowering spring-late summer . Swamps, palmetto; 0-10 m; introduced; Fla.; s Mexico; West Indies; Central America; South America (n Venezuela); cultivated in tropical regions worldwide. Epiphyllum phyllanthus var. hookeri was recently reported by A. N. Lima (1996) from Estero Island, Lee County, Florida, growing on Sabal palmetto. The variety also occurs in the swamp at Fakahatchee Strand, Collier County, Florida. The population biology of this species, as well as its long-term persistence in the flora, need to be monitored. Details of its pollination biology are not known.